1. To make the pistachio dressing, pound the pistachios in a pestle and mortar until finely ground. Add the garlic, extra virgin olive oil, orange zest and vinegar, and stir to combine, then season. Set aside. 2. Place the salmon in a pan where it fits snugly. Cover with cold water and bring to a very gentle simmer. Cook gently for 10–12 minutes, then remove from the water and drain on kitchen paper before skinning and breaking it into large flakes. 3. Meanwhile, cook the asparagus and green beans in boiling salted water until tender, then drain and refresh. 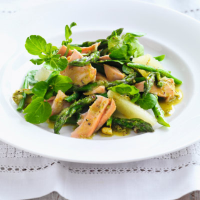 Arrange the salmon, veg, grapefruit segments and watercress on serving plates. Drizzle with the pistachio dressing just before serving.